It’s difficult to believe that such a simple device can make an impact on the performance of certain models of 6.2L-powered 2015-2017 Cadillac Escalades, Chevrolet Silverados, and GMC Sierras and Yukons. Yet the 200-639 AIRAID POWERAID throttle body spacer has been proven in back-to-back testing to improve midrange power. 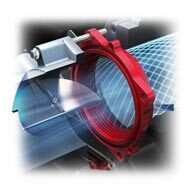 The concept of a throttle body spacer is based on real science. Lengthening the plenum of the system provides a greater volume of air from which the individual cylinders can draw. Based on careful mathematic calculations, AIRAID engineers have determined how much to lengthen the intake to achieve the greatest benefit over the greatest RPM range. 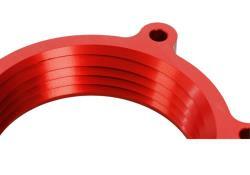 The POWERAID throttle body spacer is designed to enhance off-idle torque from 800 rpm to approximately 3,000 rpm. In addition, the POWERAID throttle body spacer features a patented helix bore design with a helix pattern on the internal surface of the spacer. This helix bore can be referred to as a vortex generator in that it helps resist flow separation by creating a vortex as the airflow passes through the spacer. This results in higher airflow efficiency with the benefit of faster cylinder filling for improved performance. Each AIRAID POWERAID throttle body spacer is manufactured from the highest quality aircraft grade 6061-T6 aluminum. POWERAID kits include the necessary gaskets, hardware, and precision brackets to maintain proper geometry with the factory components. Inserted downstream of the throttle butterfly, installation takes only about an hour and is thoroughly covered in illustrated instructions included in the shipping carton. And of course, the 200-639 POWERAID throttle body spacer is backed by AIRAID’s “No Hassle” Lifetime Warranty.